Saturday a friend and I had a late breakfast at Ducks Kitchen in Decatur, GA. If you find yourself in Atlanta sometime, check it out. Be sure to sample their homemade baked goods. Delish! After breakfast we headed up to Ballground, Georgia for a tour of Gibbs Gardens. 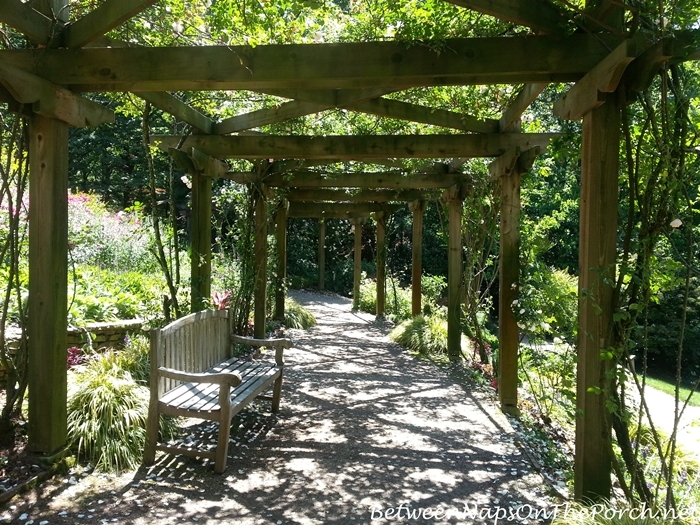 Gibbs Gardens is privately owned and is a dream project the owner, Jim Gibbs, had in his heart for 30+ years before it finally reached the point where he was ready to open it to the public for tours. Gibbs Gardens, located in the foothills of the North Georgia Mountains, stretches over 220 acres. The property includes beautiful mature forest, spring-fed streams, ponds and lakes. The garden is divided into two main portions: The Manor House Gardens and The Valley Gardens. 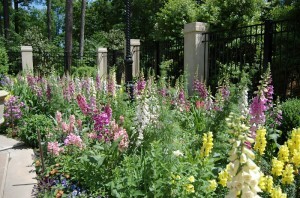 The Manor House Gardens surround the Gibbs personal home that was designed and built in a European style, a style the Gibbs came to love after years of extensive travel. 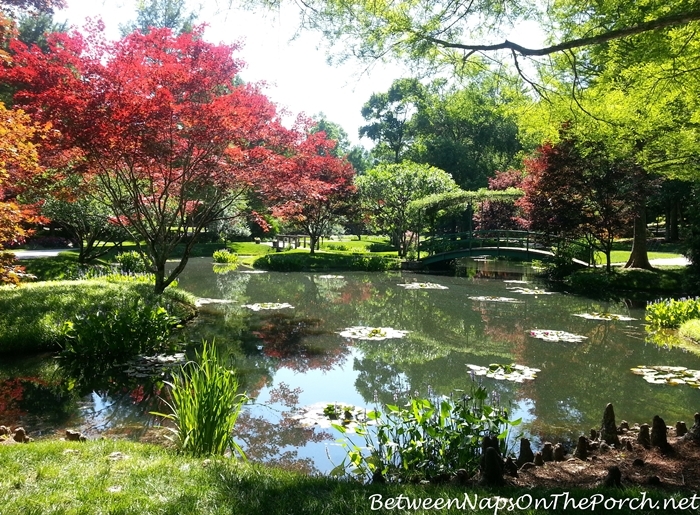 The Valley Gardens include a Japanese Garden that is the largest in the nation. We were too late in the season to see the daffodils in bloom. Jim Gibbs started planting daffodils thirty years ago and so far he’s planted over 3 million daffodil bulbs. 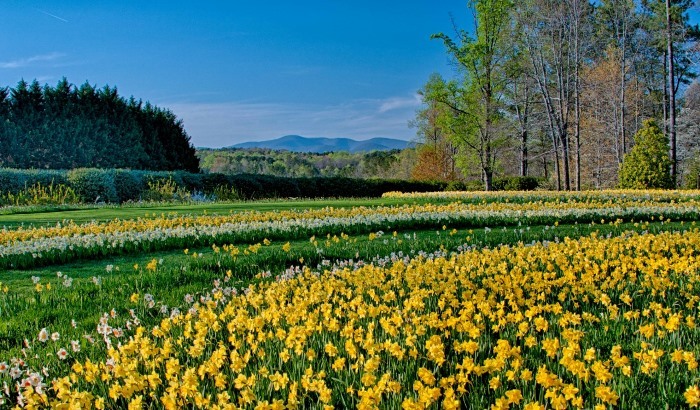 The bulbs have divided many times over the years so when spring comes around, on a tour to the garden you’ll see over 20 million daffodils in bloom! Can you just imagine how wonderful all those daffodils must smell! You can actually buy daffodils bulbs at the Gibbs Gardens website. 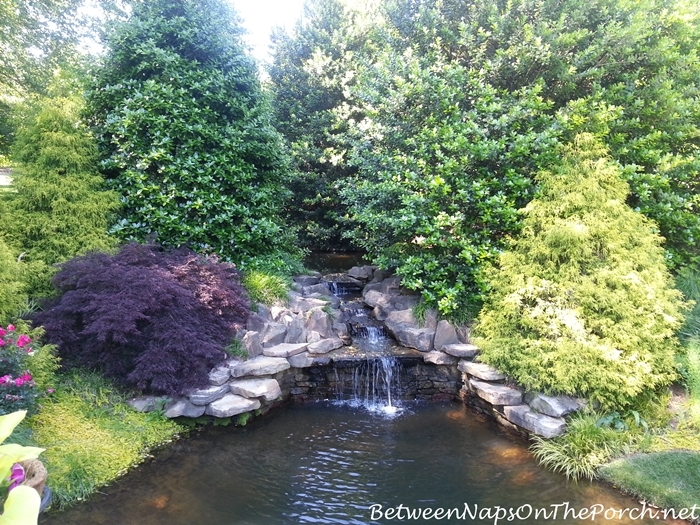 As we entered the gardens, we passed over a pretty bridge where we enjoyed the sounds of this beautiful waterfall. 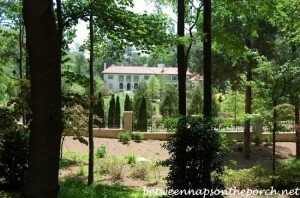 We started out by riding a tram up the hill to see the gardens surrounding the Gibbs home. As you stand near the home and look out, you can see part of the gardens below. 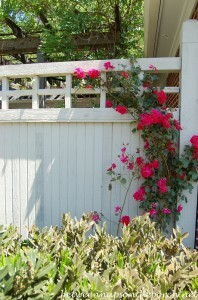 We walked down the hill away from the house and I could see the New Dawn Roses that cover the long arbor below. 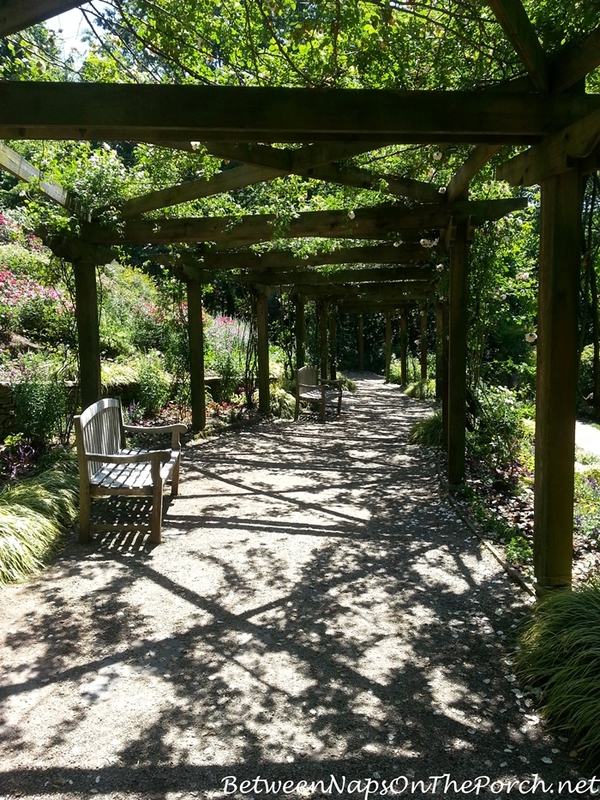 This trip to the gardens was a spur of the moment trip so all these photos were taken with my phone. The Manor House is surrounded by beautiful gardens. 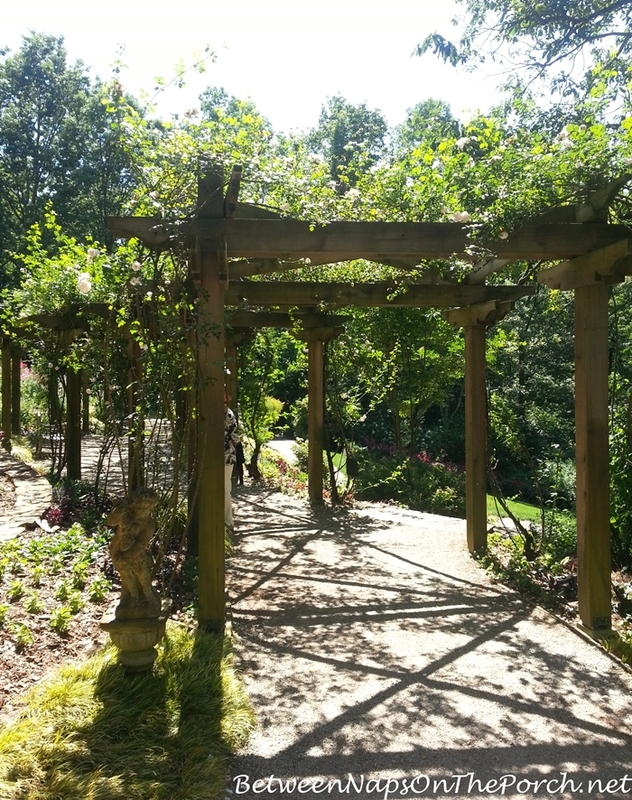 I walked down to the rose arbor to get a better look. It was absolutely magical walking underneath the arbor. What a dream it must be to have a property so large, you can take a daily walk for exercise and never even leave your own home. And what a dream walk it would be! Do you see a few roses peeking down? 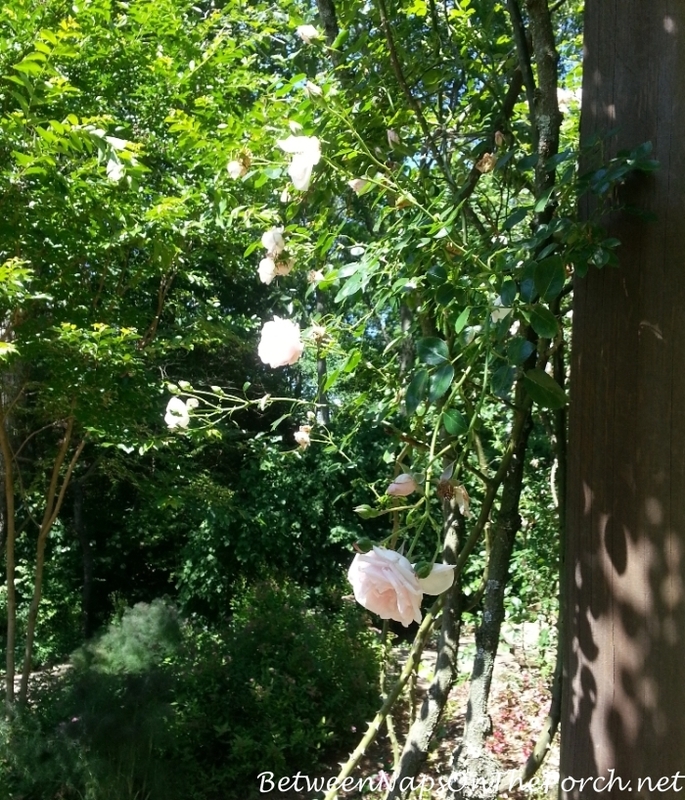 I loved how the light made its way through the roses growing overhead, creating wonderful shadows below. 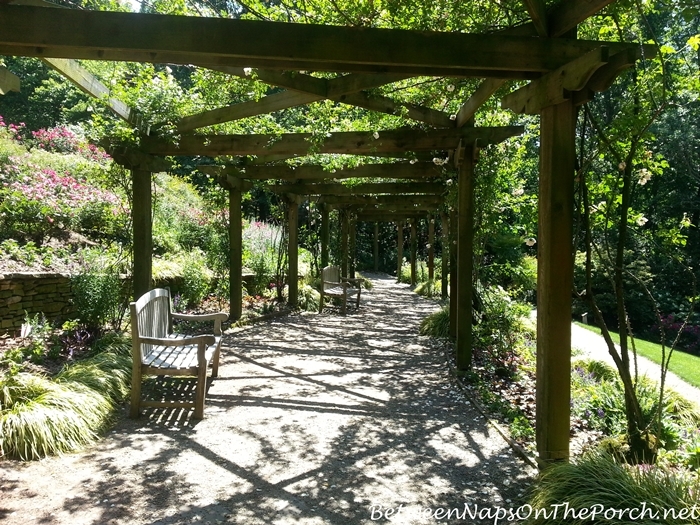 A walk underneath the arbor is truly magical! The roses are just starting to bloom. We rode the tram back down and I went in search of the Monet Bridge. 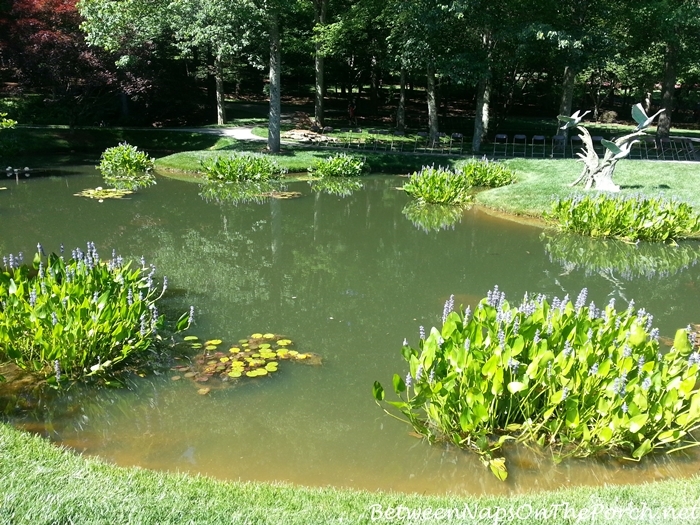 This pond was so pretty. There are lovely pieces of sculpture throughout the garden. Do you see it…the bridge in the distance? 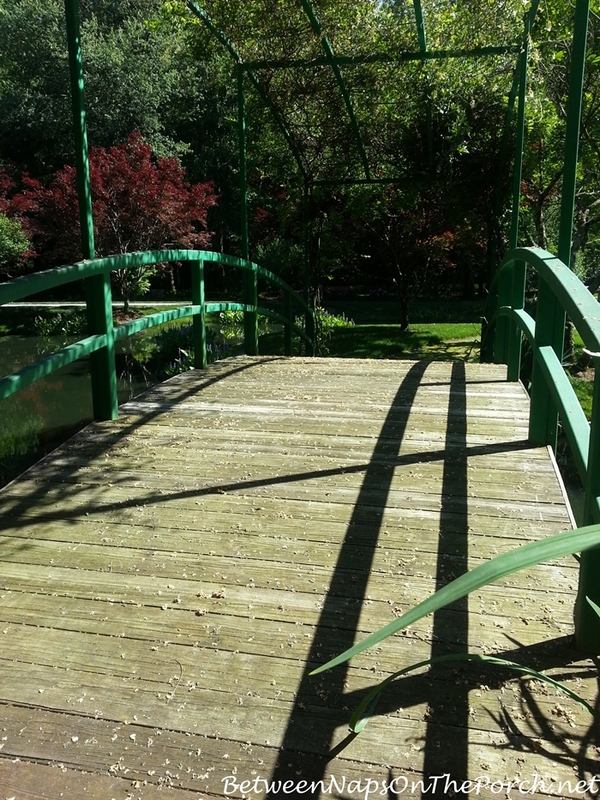 Jim Gibbs loosely modeled his bridge after the one he had seen in Monet’s garden at Giverney. I walked over to the Monet bridge to cross it but unfortunately, it was blocked off. Nearby I saw these funny things and immediately recognized them as Cypress knees. 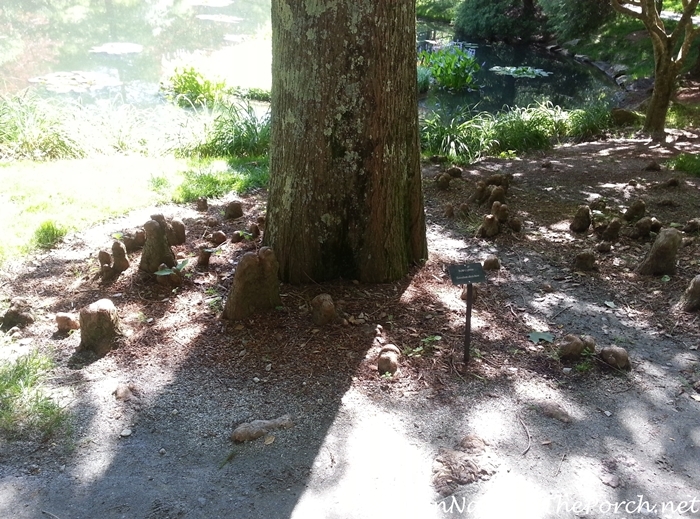 The sign in front confirmed the tree was a Bald Cypress. Seeing the tree reminded me of the trip I took last spring to Louisiana. Each time we toured a plantation home there, we were told the home had been built out of cypress wood which was plentiful back then. They are not so plentiful anymore. It was a popular wood for building homes back during that era because Cypress wood is very resistant to rot and insects. The bald cypress, while not endangered, is threatened in areas of the South and is completely gone in places up north. This can be attributed to two major factors: money and money. Lumber from Bald Cypress is priced at a premium because it is sturdy, impervious to insects, and does not rot–which might be expected of a tree that often spends much of its life with its roots in water. Most of the really big Bald Cypresses were logged out across their range; giant 500-year-old specimens with diameters of ten feet or more were still being destroyed in the late 1970’s until the destruction was stopped. 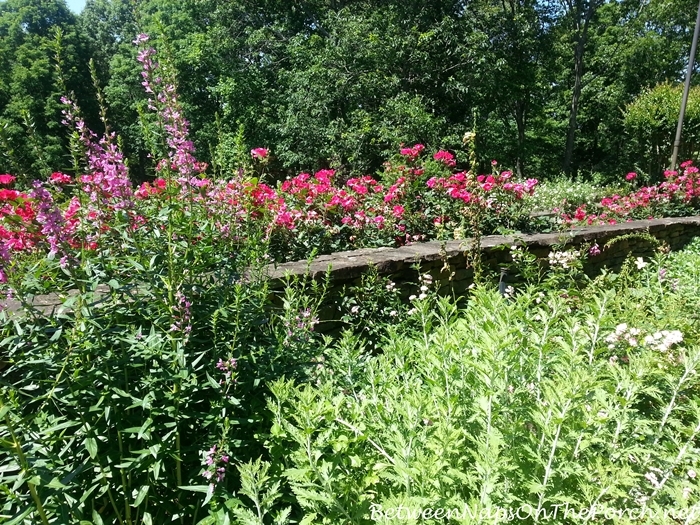 This one is growing alongside the pond with the Monet Bridge. I guess it was already here when Mr. Gibbs purchased the property because I don’t think it could have grown as big as it is in just 30 years. Sorry I didn’t get a picture of the tree itself, I was way too close to it to take a picture plus, I was just too mesmerized by the knees. They are just so fascinating to see. You can see the funny little knees again in the lower left of this photo of the bridge from the other side. 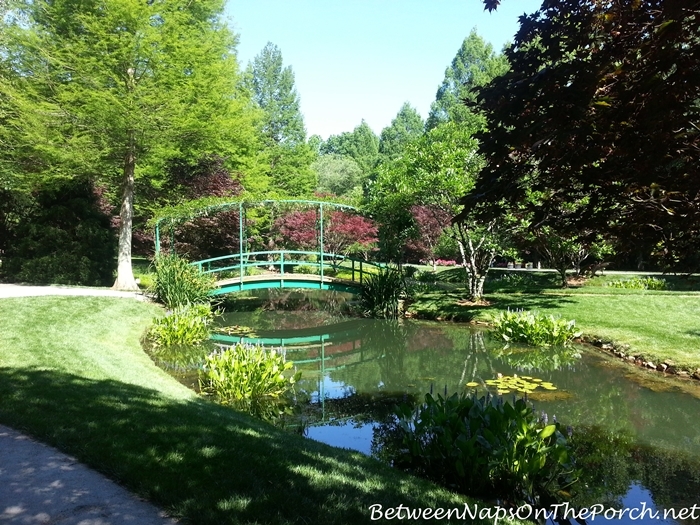 Looking back at the first photo of the bridge from the other side, I think the Bald Cypress is the tree circled below. We didn’t make it through the whole garden that day. 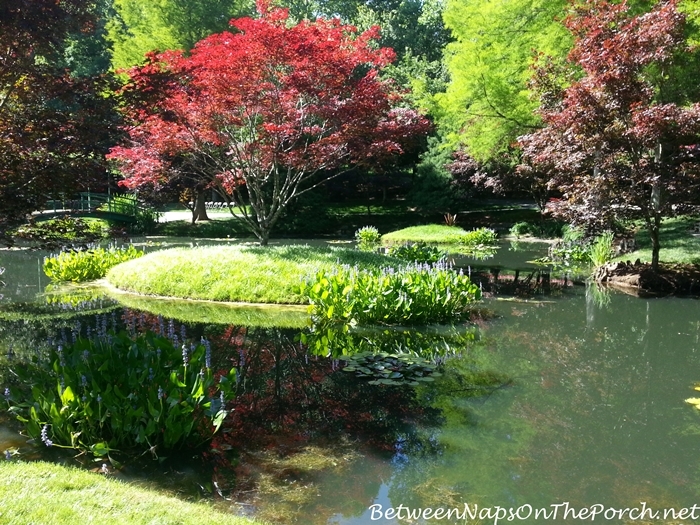 I’m looking forward to returning to see the Japanese Garden. 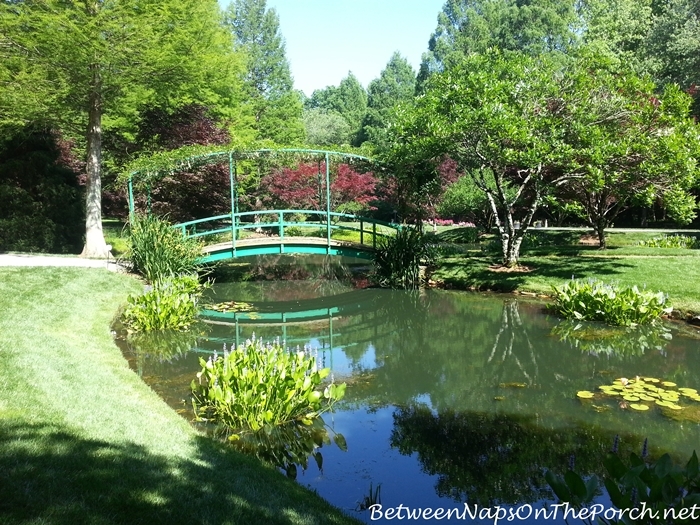 Gibbs Gardens is truly one of the most beautiful gardens I have ever visited. If you are ever in the Atlanta area, try to see it. It’s about an hour north of Atlanta and very much worth the drive. I’m definitely going back next spring to see the daffodils but something tells me I’ll go again before then. Those gardens are beautiful! All of those yellow daffodils, just stunning! 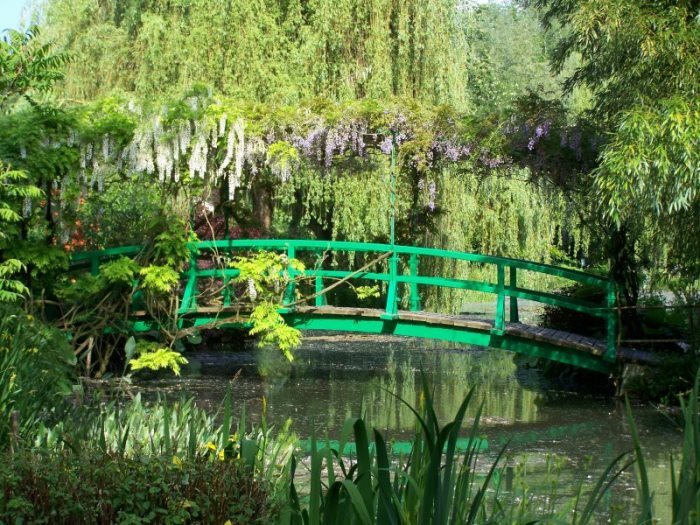 What a beautiful Monet bridge and garden. The whole place is lovely. I love the arbor too. There’s a beautiful arbor in So. Pasadena at what was the old Hungtington Hotel…which has been named several other names…The Ritz Huntington at one time. Not sure of the name now. But there was wisteria blooming and hanging all over it one spring day when I went. I didn’t want to leave! Really enjoy your posts, and this was a delight as well! Wisteria is so beautiful and smells so gooood when it’s blooming! I bet that was an amazing sight! Beautiful! I am only disappointed I was not invited to go along. What a wonderful family, to build such a beautiful garden and allow the public to tour it. 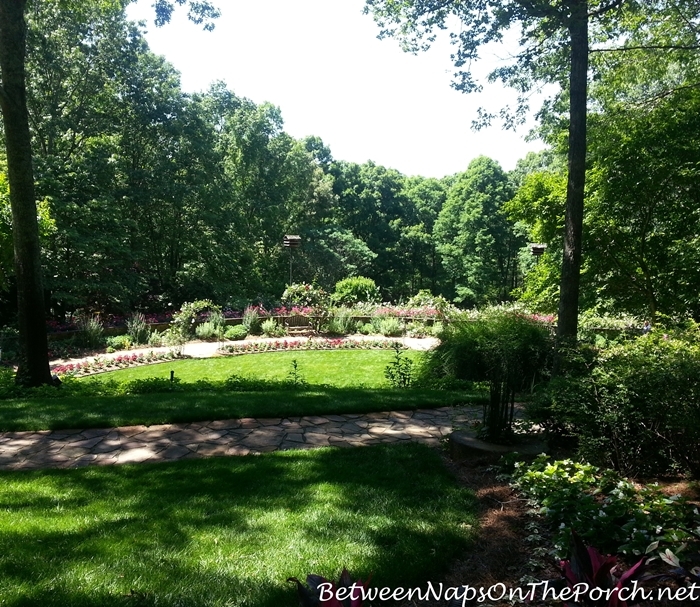 Gardens like that evoke such a feeling of peace and well being, don’t they? 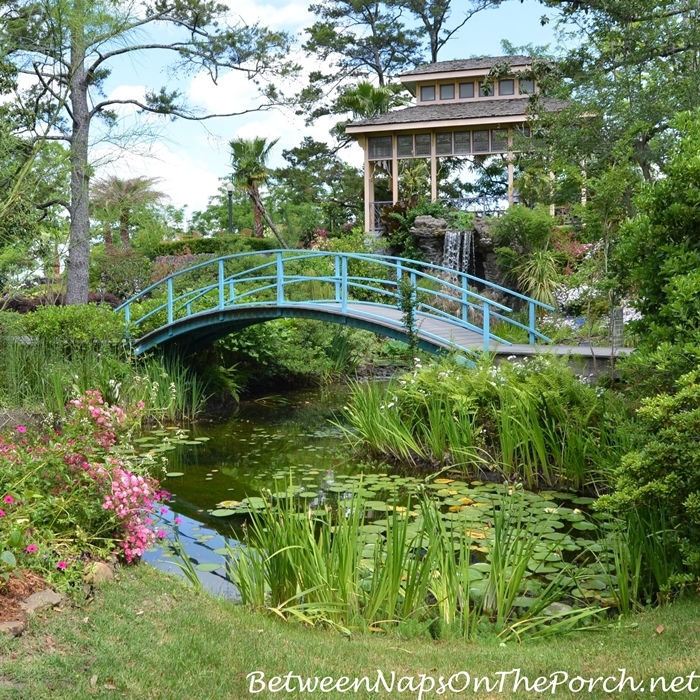 So, what might I have in common with this garden … well, I have a painting of Monet’s bridge AND I have a bald cypress in one of our rain gardens. I can tell you, that little guy is hardy! He has grown so much in the 5 years we have been here, even though one summer we were hit by drought and I was worried I’d lose him. I talked to him and watered him and asked him to stick around and he is thriving. He is a pale green and his arms shoot out horizontally. He’s in the rain garden with a weeping willow, which is a darker green and they look so pretty together. I knew cypress were big, but I didn’t realize they grew as large as you mentioned. It reminds me of the verse in the bible where we are told leviathan had a tall as large as a cypress tree. Yikes! That’s one big dinosaur / sea creature. Your soul must be so refreshed after having been in this garden. Mine is and I only have the pictures, not the sounds, or the smells or the wind in the trees. Ah! 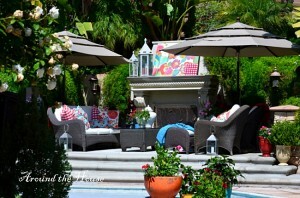 What a lovely garden and, I’m sure , perfect day as well. Looks soooo peaceful. I’m putting this place on my “to see” list next time we’re down to GA. Thanks for the beautiful tour. so beautiful! maybe i will see it someday!! Beautiful!!! 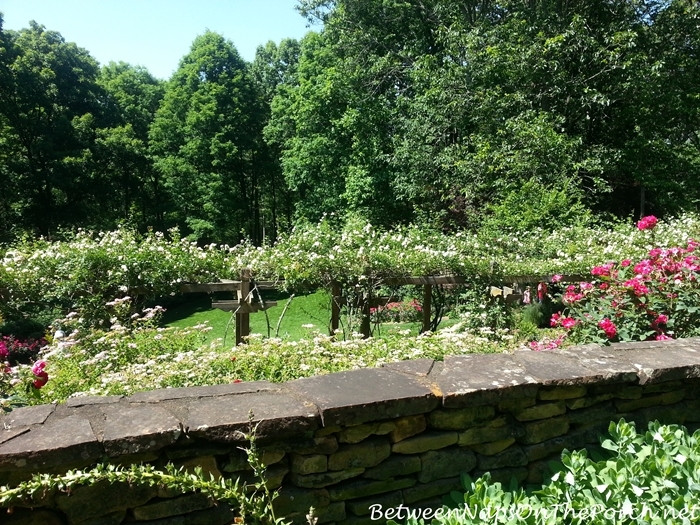 I love touring wonderful gardens. Daffodils are my favorite spring flower. Would love to visit some day. How peaceful.